Lazair.com • View topic - Must not of panned out! Must not of panned out! Found the following article and thought it would add a bit of historical knowledge to the Group. Good article, thanks for posting it. Yes the WAM (Westlake Aero Marine) 342 was a miserable disapointment and embarassment. While preparing to fly at Sun N Fun with these engines the factory demonstrator threw a crank (with prop) for all the World to see. There were high hopes that this engine would be perfect to power the Lazair II 2-seater and the advanced single seat models (Elite, SS). At the time this article was written the available choices for lightweight Lazair engines was limited. Ultraflight instead adopted the twin cylinder JPX PUL 425 and KFM 107E as standard engines. Neither of these engines were perfectly suited for the Lazair either. Hi Tyler, I think you understand what I meant. If not then here's a long winded explanation of my opinion. The JPX is a great engine and performance with them on the single seater is super. They are smooth running reliable engines. My point however was the JPX was just a bit heavier than what many (Americans) considered to be "ideal". Ultraflight thought they had a winner in the WAM-342 as it had a HP close to the JPX while weighing nearly the same as the Rotax 185. As a consequence of the problems experienced with the 342 Ultraflight resorted to the JPX and KFM for the Lazair II and emerging "Elite" prototype model. As a consequence of the added weight, power, and performance of the JPX and KFM engines the airframe of the Series 3 was subsequently upgraded. The "Elite" was born. These modifications pushed the Elite up to a weight close to, or in excess of, the 254lb FAA 103 weight limit. Ultraflight, unlike its major competitors tried to keep the Lazair (single) a truely Part 103 compliant Ultralight (for American sales). 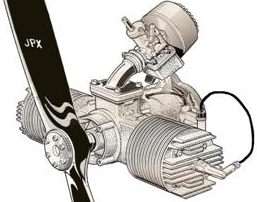 Usage of the JPX engines (in America) along with necessary airframe upgrades limited the amount of accessories (like the full enclosure) one could use and remain truely legal. The Series 3EC even with Rotax 185s was "danger close" in exceeding the 254lbs limitation. As you mentioned the Lazair II has marginal performance with JPX's and we know the KFM's have outrageous fuel consumption. Were either of these engines "Perfect" all things considered... I'd say no but I guess Ultraflight did the best they could at that time. OK I'm lost-- The article says that the WAM engines are "horizontally opposed twins"
but the picture looks like it has vertical-cylinder singles (kind of like a 185). Hi Bill, the picture is just for reference in the article. The Lazair in the picture is equipped with Rotax 185s. The engines in the article's picture are good old Rotax 185's. When I have a few minutes, I'll try to follow up with some history on the Westlake engines and Ultraflight's plans to become their North American distributor, and why it didn't turn out. Steve are there any other Lazair related articles in those old issues of Ultralight Flyer ? I flew with a guy over 20 years ago in a 2 seater and i forget the engines. His name was Glen Kitchen and he was a Lazair Dealer in Woodstock Ontario. Tyler he would make you look like a dwarf as i think that he was well over 300 lbs and fat and i flew his 2 seater with him in right and i was about 165lbs at that time. And to be honest i think it was a great flying lazair . although i do not recall details it seemed to perform pretty well. I know a few guys that flew with glen and ordered a kit right on the spot. After flying with a huge man like that in the flying lawnchair many were sold. Over the Christmas break I had access to many years worth of "Sport Aviation" magazine (but not to a scanner) and was able to find a few articles on the Lazair. Hopefully some of you also have such access or maybe I can scan them in someday.